Everybody has a dark side. Chocolate’s dark side might not be so bad, though. People say dark chocolate is good for the health. According to WebMD, it can lower blood sugar (if you’re a certain age) and contains antioxidants, which does lots of good stuff for your skin and body, like prevent wrinkles and diseases. If that’s true then maybe you should consider having more of those nights of socializing with red wine and dark chocolate. But what is dark chocolate? 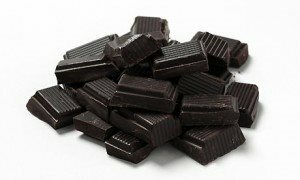 The Food and Drug Administration defines dark chocolate as having at least 35 percent cocoa solids and less than five percent milk solids. Dark chocolate is like milk chocolate without the milk. This explains why there are variations of dark chocolate, such as 70 percent vs. 80 percent. For dark chocolates, the higher the percent the more cocoa in the chocolate and less of other ingredients. The taste difference between milk and dark chocolate is more obvious in darker chocolates. Due to the lack of milk, dark chocolate is harder, sometimes with an almost chalky texture, and has a more prominent chocolate flavor. I have always thought milk chocolate is sweeter than dark chocolate but really it can be just as sweet as milk chocolate. The difference is not in sweetness but in how creamy the chocolate is. Next time you decide to get chocolate, do yourself a favor and try to find a love for the dark side.